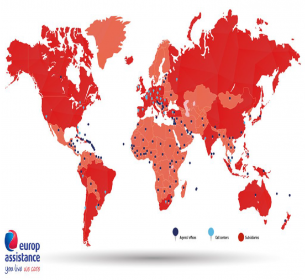 Universal activity: In 1963, Europ assistance which is the pioneer of this concept by developing assistance services, serves more than 300 million people all over the world. Europ assistance group which has 8000 staff and 33 local companies, supports this service with 4,25,000 suppliers integrated with international support services and vision. The developement of personalized support services represents an opportunity for more frequent use of EA businesws lines. So we are with our customers with the necessary support in case of need. We offer effective solutions to everyday life and unexpected situations.